Nissan Motor Co. Ltd. and the Japan Automobile Federation (JAF) today announced a joint trial operation of a roadside service vehicle equipped with a charger to assist electric vehicles (EVs) which run out of battery power. The trial service commences on June 7, 2011. Nissan is taking part in a technology development project for measures to counteract global warming that was launched by Japan's Ministry of the Environment and aimed at promoting green innovation. In line with this effort, Nissan developed a prototype roadside service vehicle equipped with a charging system for EVs which become inoperable. 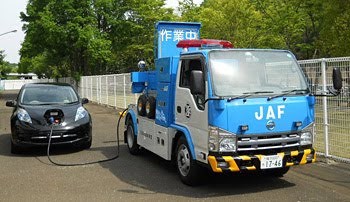 JAF will deploy the roadside service vehicle with the charger from its Kanagawa branch office and will use it on a trial basis as part of their service menu from fiscal year 2011. This trial project will be a valuable first step as Nissan and JAF move forward in promoting the real-world use of this type of roadside vehicle, intended to create a safety net and render assistance to EVs which may run out battery power, and to help stranded motorists. In December 2010, JAF conducted roadside assistance training for EVs using a Nissan LEAF, including towing, at the Nissan Education Center for its staff from throughout Japan. JAF also initiated related practical roadside service training across Japan using other EVs in cooperation with other automakers. Hitoshi Kawaguchi, Nissan's senior vice president of External and Governmental Affairs, said, "As EVs gain wider consumer acceptance, it is important to create a roadside assistance system that can help motorists driving EVs which have run out of battery power, as well as to build a charging infrastructure. Nissan is leveraging the development and trial operation of this roadside service vehicle with charging equipment – and the accompanying staff training – to strengthen cooperation with JAF and to benefit customers. This will build confidence in EV use and contribute toward achieving a society with low carbon emissions." Masakazu Kume, Executive Director, Japan Automobile Federation, said, "JAF has been working on ways to create an environment where motorists can drive EVs with the assurance that assistance is available and to support the adoption of environmentally-friendly EVs as part of our social contribution activities. Our participation in this trial operation is one of these activities. We have already prepared insulated gloves and goggles for our service vehicle staff to assist EVs. We will actively respond to requests from EV motorists as more and more EVs hit the road."